Jason Wu’s spring summer 2016 show was an edited procession of ruffled silhouettes and finely frayed edges, all ever so ladylike, making a judicious statement on poshness, keeping the design motifs trim. Beauty played with classic elegance in a minimal way: lustrous tied back hair, perfectly bare skin and a poignant wine-red lip. 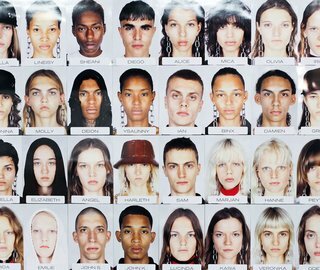 Before the collection was realized on the runway, Casey Vange captured beauty prep backstage and Wu’s affection for de rigueur casting as girls like Lineisy Montero who opened the show in a gauzy jade trench, or runway pros like Hedvig Palm, Xiao Wen Ju and Mica Arganaraz all glowed in their final looks pre show.